Channel your inner domestic goddess without breaking a sweat by whipping up a batch of deliciously crispy, light cookies using self-rising flour in place of the all-purpose flour that's the more common choice. Whether you've run out of all-purpose flour or baking powder, or you're looking to use up that bag of self-rising that you rarely break into, understanding how to make the switch is the key to successfully baking with self-rising flour. Although it can't be used for delicate, flaky baked goods such as pie crusts, you can feel free to experiment with the ingredients in your favorite cookie recipes. You'll hear a lot about self-rising flour if you search for recipes to make Southern biscuits, since it's a popular product for that particular cuisine. But you don’t need to reserve your bag of self-rising flour only for making tender, fluffy biscuits. While it won't work as a substitute in all baked goods, you can use self-rising flour to make cookies, as long as you understand the necessary adjustments. Unlike all-purpose flour, self-rising flour contains more than just the wheat. It also has salt and baking powder, which makes it similar to baking mixes. It's typically milled finely, with a similar texture to that of all-purpose flour. Making the switch is relatively easy, but you do need to make a couple of adjustments to your recipe. Most notably, you need to leave out any baking powder or salt from your recipe. According to the Joy of Baking website, self-rising flour contains roughly 1 1/2 teaspoons of baking powder and 1/4 teaspoon of salt, which means that if your recipe calls for 1 cup of all-purpose flour plus salt and a leavener, you should add an extra 1 3/4 teaspoons of self-rising flour to account for the other ingredients. You'll typically only need to add wet ingredients such as eggs, vanilla extract and unsalted butter, along with sugar and extras such as chocolate chips or nuts. 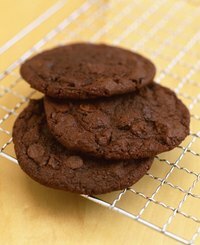 If you're looking to bake lighter, crunchier cookies, self-rising flour might be an ideal substitution. Although the flavor itself won't be affected by swapping self-rising flour for the all-purpose flour that your recipe calls for, the finished cookie will have a slightly different consistency and a lighter texture. While all-purpose flour typically has a protein content of roughly 10 to 12 percent, self-rising flour usually contains approximately 8 to 9 percent protein. Self-rising flour has a lower protein content, which translates to a lower gluten content. Baked goods made with lower-gluten flours are lighter and crisper than than those made with higher-gluten flours. Because baking soda's leavening power works differently than baking powder -- and it's roughly 4 times stronger, if your recipe calls for baking soda, you might need to include it to get the results that you want. Trial and error is a big part of substituting ingredients. You might need to to experiment with the recipe to find the formula that works best. Additionally, it's important to note that self-rising flour has a shorter shelf life than all-purpose flour. While all-purpose flour has a shelf life of approximately six to eight months, you can store self-rising flour for roughly four to six months. Beyond that, some of the leaveners may begin to weaken, leaving you with potentially flat cookies. Eat By Date: How Long Does Flour Last?